I start IDEA via Idea64.exe. Judging from the Help | About screen, it's using JDK 1.8.0-ea. I have downloaded JDK 1.8.0-ea to evaluate it, but just unzipped the JDK and didn't install the Java 8 JRE. However, a search of my Windows registry revealed something (IDEA?) installed a 1.8.0-ea JDK, with a registry entry keyed to "HKEY_USERS\...\Software\ej-technologies\exe4j\jvms\c:/program files/java/jdk1.8.0/jre/bin/java.exe"
I'm not 100% sure why IDEA64.exe is using / picking up JDK 1.8.0-ea, but I suspect that is the culprit. My JAVA_HOME points to a JDK 1.7 installation. I then have JDK_HOME and JDK_64_HOME pointing to the JAVA_HOME env var. 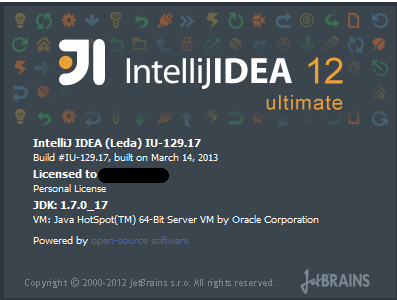 So my question is this: How do I get IDEA64 v12.1 (IU-129.17) to not use JDK 1.8.0-ea and use a different JDK? I'd prefer it use the one I reference in JAVA_HOME / JDK_HOME / JDK_64_HOME. Also, to confirm, does the Help | About screen show the JDK that IDEA is currently using, or the JDK version is can use / shipped with? 'About' dialog shows 'java.version' system property's value there, so, it must be information about jre used to run the ide process. I went into the Windows Control Panel | Programs and Features. Sure enough, JDK 8 was listed there so that's probably what caused IDEA to pick it up. I uninstalled JDK 1.8.0-ea and now IDEA is reporting it's using JDK 1.7.0_17. So far, so good. I'd like to continue evaluating JDK 1.8.0 and would like to install the latest update (jdk-8-ea-bin-b80-windows-x64-07_mar_2013). However, I don't want IDEA64.exe using JDK 1.8.0. I want IDEA to use the stable JDK 1.7.0-17 version. So my original question remains: How can I specify the JDK IDEA64.exe is using? I'm hoping there's a command line arg, or environment varable, or something I can set to control this. What IJ version do you use? Native windows launcher was changed recently, there is a possible case that a bug was introduced there. >> What IJ version do you use? Native windows launcher was changed recently, there is a possible case that a bug was introduced there. I believe I've been seeing JDK 1.8.0-ea getting picked up for several v12 EAP versions. I thought maybe IDEA installed with 1.8.0-ea, but only learned today it was picking it up from my environment - despite my having set JAVA_HOME, JDK_HOME, and JDK_64_HOME to point to JDK 1.7. IntelliJ IDEA does not bundle any 64-bit JDK. 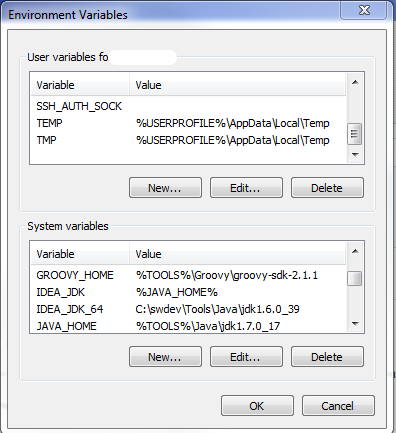 If the IDEA_JDK_64 environment variable is defined, it uses the JDK to which it points; otherwise, it uses the JDK specified by the JAVA_HOME environment variable. I can say, with some certainty, that this is not the behavior I'm seeing in 12.1 (IU-129.17) as the following screenshots show. This shows IDEA is using JDK 1.7.0_17. That happens to be what JAVA_HOME and IDEA_JDK are set to, but I don't think that's why IDEA64.exe is picking up that JDK version. Before, I had downloaded JDK 1.8.0-ea for evaluation and IDEA64.exe was using it ... even though no environment variable was set to point to it; i.e. not JAVA_JOME, IDEA_JDK, or IDEA_JDK_64. So it appears the Idea64.exe is picking up the JDK version from somewhere else, perhaps the Windows registry. My real goal here is to be able to download the JDK 1.8.0-ea, but have the IDEA64.exe IDE not use it and use one of the stable JDK versions instead. latest version as found somewhere, registry likely. That was my goal as well. With the IDEA_JDK_64 set, I have that behavior. Please take a close look at the command prompt screenshot. You will see that IDEA_JDK_64 is set to a JDK 1.6 path, but the Idea64.exe Help | About screenshot shows it is using a JDK 1.7 version. It looks to me like the IDEA_JDK_64 environment variable is not being referenced at all. The setting of an environment variable within a command shell is valid only for that shell. It is not valid outside that shell. (If you open a second command window and execute the java version command, you will see it is not the value you set in the first command window.) So after setting that, if you went to Windows Explorer or the Start menu and launched IDEA, it would not use the value set in the command window. You'll need to set IDEA_JDK_64 via the control panel applet. So in fact, if Idea64.exe was reading IDEA_JDK_64, it should be using the 1.6, not 1.7, version of the JDK. Sorry, I looked at the screenshot too quickly.